Brand New Luxurious Beverly Hills Condos! This Gorgeous 938 Sqft Unit Is Bright, Spacious & Features Tons Of Upgrades.Practical Floorplan & 9' Ceilings. Enjoy Lots Of Natural Light & Unobstructed Views.Modern Kitchen: Granite Counters+Ss Appliances. Stunning Master W/Spa-Like Ensuit, His/Her Closets & Private Balcony. Bus Stop Right At Ur Front Doors, Steps To Hillcrest Mall,Groceries,Cafes & Restaurants. Min To Viva/Go, Theatre,Entertainment,Schools & More! Want to learn more about 514-9201 Yonge St (Yonge / 16 Th)? I would like to learn more about 514-9201 Yonge St (Yonge / 16 Th). I could not have asked for better real estate agents. 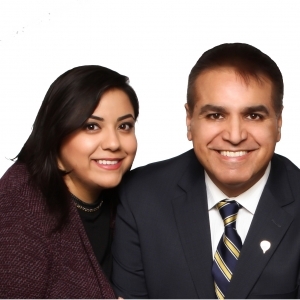 Hedy and Kamran are dedicated, passionate, forthright and go above and beyond! I am a lawyer, very detailed-oriented and a demanding client and they well-surpassed my expectations! They were always very responsive, very empathetic and supportive, knowledgeable and strategic, patient and excellent at explaining things so that I could be well-informed. I could tell Hedy would do an excellent job for me in negotiations (which she did), because of how compelling she was in conversations with me. Importantly, she never took anything personally, despite my candidness about anything that concerned me. Their goal throughout was to provide the best service possible. And that is what they did! From taking amazing professional photos of my condo, to polishing perfect listing remarks, to offering tips on staging, to advertising and relationship-building with agents. The cherry on top is that Hedy is a very down-to-earth, relatable person, a true pleasure to deal with. I recommend Hedy and Kamran without reservation!